Three weekly newspapers will no longer cover sports stories after being relaunched in a magazine-style format next week. 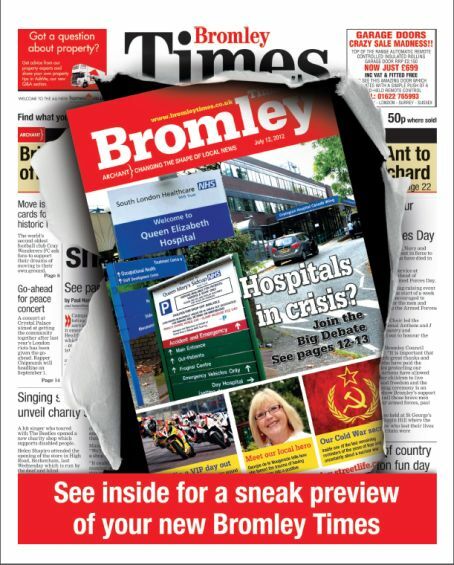 Archant London is revamping its Bromley Times, Bexley Times and Gravesend & Dartford Reporter from 12 July in a quarterfold size, a similar size to A4. The company says there are no redundancies as a result of the move but it is understood some sports roles that became vacant leading up to the relaunch were not replaced. He added there would only be the occasional feature written about sport. A wrap around this week's paper shows how the revamped title will look. The company says distribution of the free 112-page titles, which are part of the Kentish Times series, will increase from 50,000 to 80,000 and the papers will focus on local feature content as well as news. Ilford Recorder editor Chris Carter has been seconded as launch editor for the titles, working with group design editor Steve Bodycomb and the Kent team over the coming months. A story in this week’s paper said: “From next week a new-look, compact size Times, presented in a fresh and innovative design, will be out and will feature stories that reflect the vibrant community it serves. In the story, Chris said: “We believe readers will be excited by the new compact Times, which we have reshaped after listening to their views and those of our advertisers. “We believe readers will be excited by the new compact Times” says some Archant suit. Believe me, mate, readers (if you have any) haven’t been excited about the diminishing rag for years and years. This tacky change will make zero difference. No news? No sport? Can’t see that lasting for long. It’ll be too unpopular with the “clubs and organisations through the words of their members” – village cricket, kids’ teams, etc etc. And I don’t think there’s enough demand for Yesterdays-type stuff to compensate. Good news and heroic (but non-sporting) deeds only have been tried before and failed! Oh dear. This has the hallmarks of a spectacular failure! This sounds like the last throw of the dice for a series of papers which have been terminal decline for more than a decade. Anyone familiar with the product (or who worked there) knows the real damage was done between 2001-2010 when a once fine publication was turned into a complete and utter joke. Archant solved one problem by finally coming to their senses and finally rooting out the sole cause of that decline but by this stage it was sadly far too late. It is Archant who must ultimately bear the biggest responsibilty for completely ignoring the problem during this period of abject failure and disaster. An unwanted move to the East End quickly followed and now this. I give the new magazine 18 months max before Archant pull the plug once and for all. A local ‘newspaper’ without news or sport? Strikes me as a monumental mistake.